While searching for wheel spacer for our shop car to make the wheel clear the brake caliper, we were looking for one that is strong and light weight. Unfortunately, there is none in the market except the standard cast aluminum or 6061 aluminum which to us as risky to be on our race car. Instead, we ordered 6ft of billet 7075 T6 aluminum rod and made the spacers ourselves and for sponsor race cars. The feedback is outstanding and therefore we are proud to offer a full line of wheels spacers for all vehicles and sizes. 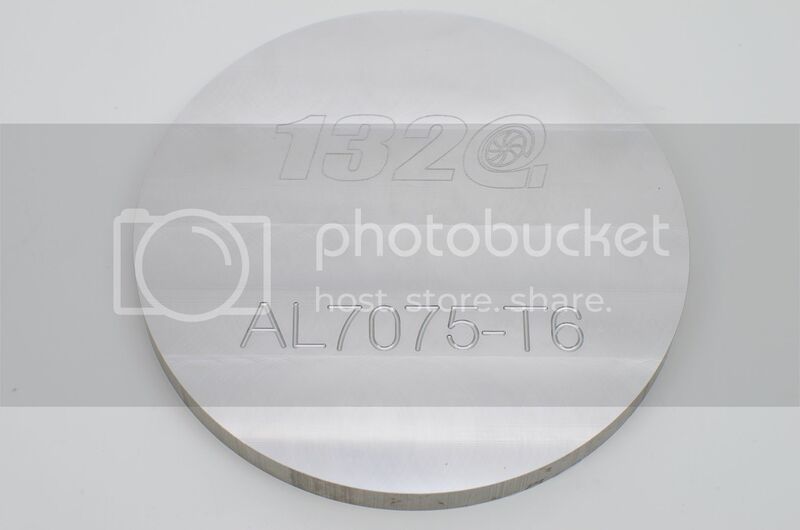 1320 Performance Wheel Spacers are made from 7075 T6 Aluminum alloy which is 3x times stronger than the standard cast aluminum spacer and 2x stronger than the 6061 Aluminum alloy. They are incredibly strong and very lightweight. Every spacer comes with 10.9 Grade stud and heat treated Grade 8 nuts. Our spacers bolt onto the existing studs. These are hub centric spacers that are vehicle specific and will fit onto your vehicle's original hub perfectly without any gap. Wheel spacers move the wheel out from the hub, effectively widening the stance of the vehicle and lowering its roll center. This simple modification increases lateral stability, which in turn provides improved handling & greater safety. This auction is for one pair (2 pieces) wheel spacers in the size listed above. On NSX and S2000 these will fit the front wheels due to the center bore is 70.1 these will not work on the rear of the s2000 and NSX due to rear center bore is only 64.1 please make sure you purchase the correct one. WARNING: INSTALLATION OF ANY COMPONENT OR SYSTEM SHOULD ONLY BE PERFORMED BY THOSE EXPERIENCED IN AUTOMOTIVE MECHANICS AND PROCEDURES. If you are unsure about the instruction below or do not have the proper tool, please seek professional help to avoid future damage. To install 1320 Performance wheel spacers Kit, please follow these steps: 1. Remove tire as per manufacturer Service Manual procedure. Remove drum/rotor retainer clip(s) if present. 2. Have another person apply brakes to prevent drum/rotor from spinning. Assemble spacer to drum/rotor face by torquing provided wheel spacer lug nuts to factory torque spec. USE ONLY TORQUE WRENCH. (DO NOT use more than one spacer per wheel and DO NOT use an air or electric impact gun). 3. Install your wheel to wheel spacer using your own lug nuts. Tighten lug nuts in a crisscross pattern to factory spec. 4. To ensure wheel spacer lug nuts are properly seated, after driving 50 miles please remove the wheel and check wheel spacer lug nuts by torquing them to factory spec again. If wheel spacer lug nuts move when torqued at factory spec, please go back to Step 2 and repeat the installation. Otherwise, please move on to Step 5. 5. Re-assemble your steel/aluminum wheel to wheel spacer using your lug nuts. Tighten lug nuts in a crisscross pattern to factory spec. * Follow manufacturer torque spec. * Do not use electric or air impact guns on the spacers nut or studs. These actions will void warranty. 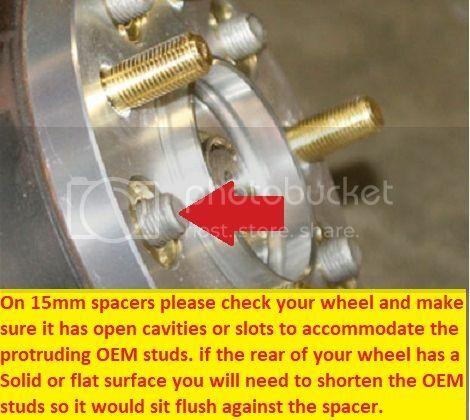 Note: Must check the wheels have open slots or cavities when you are going to purchase any 15MM Wheel spacers. 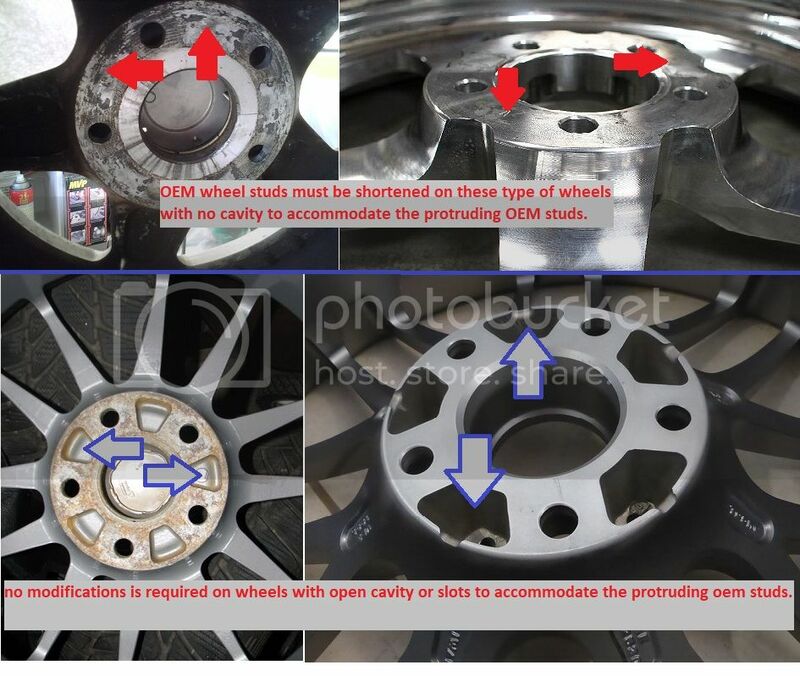 If the back side of your wheels has no open cavity or open slots, the OEM studs must be shortened therefore your wheels can sit flush against the spacers. Please check pictures below! RETURN: In the case of returning or exchanging the product, you must email us first to obtain a returned merchandise authorization (RMA) number. Customer will be responsible for paying all shipping & associated costs for sending the product back to us. The shipping that we initially charge is not refundable. All returns are subject to a 20% restocking fee and the returned product must be in unused, original condition. We will not take any returns or exchanges after 2 weeks from the date of sale; reserve the right to reject any return or exchanges.